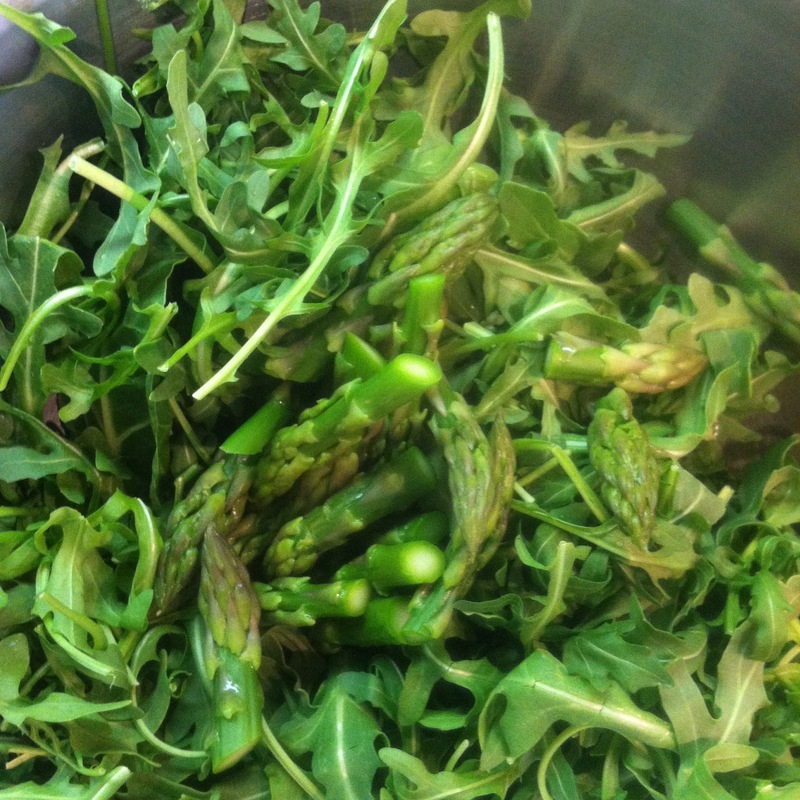 Spring has truly sprung with early summer offerings already available at many bay area farmer's markets. From asparagus to zucchini I just can't seem to get enough inside my belly before it disappears. I was at the Marin main farmer's market last Sunday only to discover my favorite asparagus farm Zuckerman's had already ended it's season. This was right after I had discovered this recipe, therefore I have been sourcing asparagus anywhere I can to make this recipe over and over until I'm sick of it. I bet it would freeze well, note to self to do such a batch. I adapted this recipe out of Sunset magazine's May issue. It's by chef Michael Chiarello who just opened a new restaurant in San Francisco called Coqueta. His recipe was for a Insalata Piadine, an Italian specialty of a "crisp warm dough with a highly flavored sauce and a cool salad". It was delicious, but this version was a bit easier to tackle on a Tuesday night for my family. Essentially, I made mine with whole wheat gemini pasta (corkscrews), where his was served over something resembling a pizza crust. I recommend trying both versions. Preheat oven to 400 degrees. Cut tops off of garlic, sprinkle with salt and pepper, and drizzle with olive oil. Wrap in foil and roast in oven for 1 hour. Let cool, then squeeze cloves out from skins. with kosher salt. Boil asparagus about 3 minutes, or until tender; remove and spread out to cool. Cut asparagus into thirds and save tips for salad. 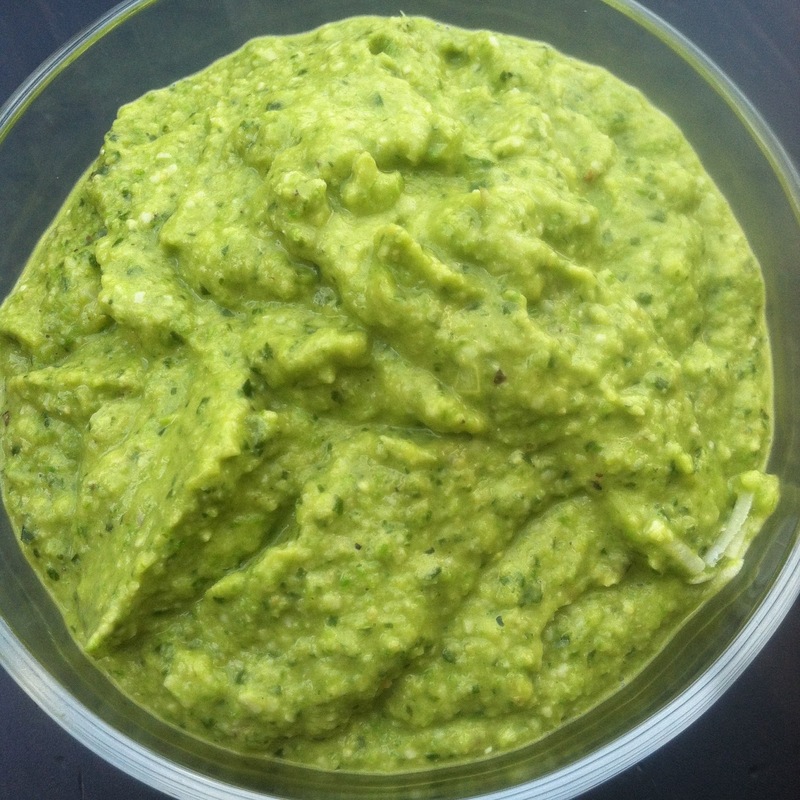 In a food processor, pulse together asparagus stalks, pine nuts, basil, sea salt, and pepper to taste. With machine running, drizzle in olive oil. Add parmesan in batches, pulsing after each batch (pesto should be thick). If cheese begins to clump, add water, 1 tsp. at a time, until it loosens. Cover with plastic wrap, smoothing it against surface of pesto while removing all air pockets. Finish salad: In a small bowl, whisk 2 1/2 tbsp. oil, vinegar, 1/4 tsp. sea salt, and 1/8 tsp. pepper; set aside. Put asparagus tips, arugula, roasted garlic gloves and lemons in a large bowl. Cook pasta according to al-dente directions. 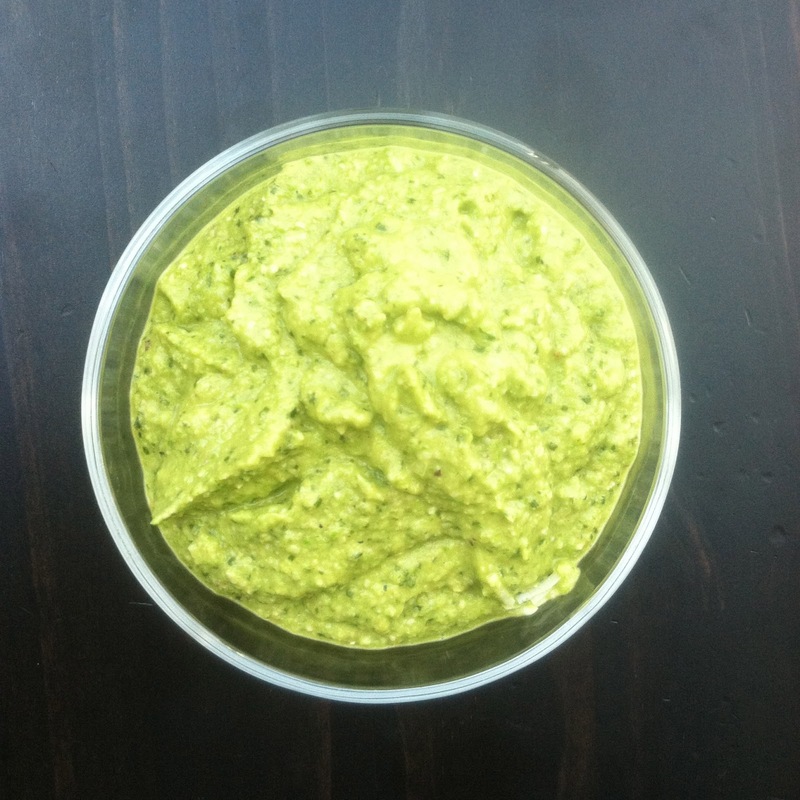 Drain and mix in pesto. 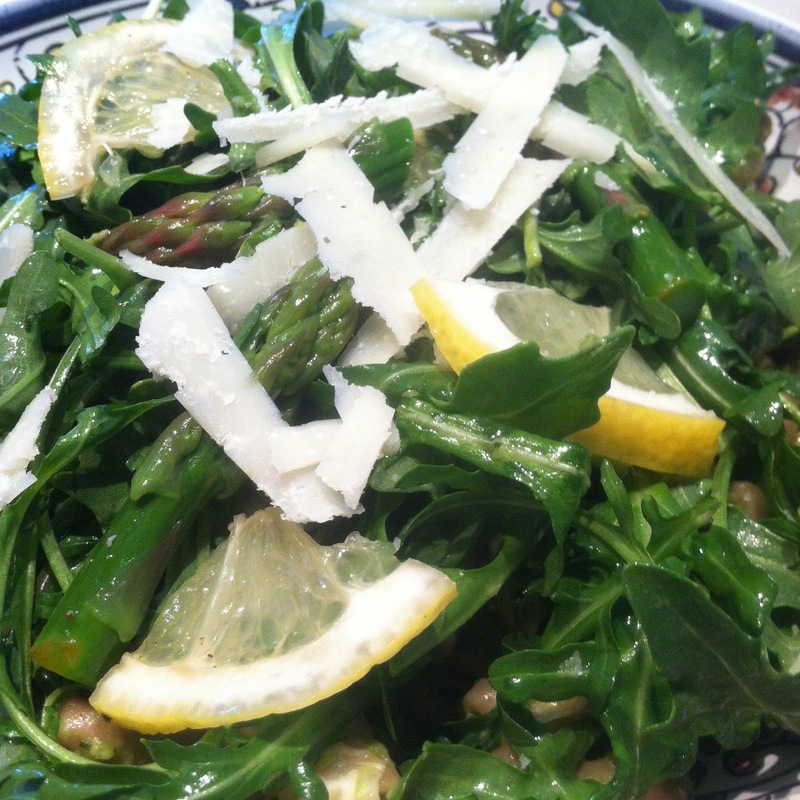 Top with salad tossed with dressing and pecorino slices. When I was a kid I didn't like many vegetables, especially the green ones. From avocados, to artichokes, brussels sprouts and zucchini, they all had this stigma attached to them. My how times have changed, but it seems my children may have picked up these same traits. I don't judge them, just thoughtfully offer them what I think is delicious. Someday I hope they will feel the same. 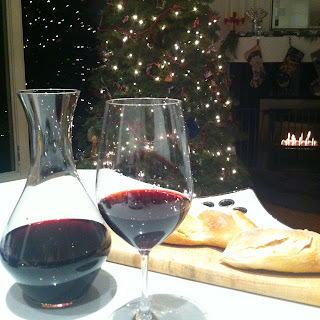 I promise to post more often as I truly love cooking and writing about it. I'm getting ready to take off on a week long yoga and hiking retreat in the Malibu hills with one of my dearest friends. I couldn't be more thrilled about it, but these last few days have had me more nervous than excited. It's called The Ashram and is quite well known for bringing out a whole new you. It is a gift to myself for turning 40 this year. I will be gone from my family for 6 whole days. My twins will turn 3 this Saturday which means I haven't been without them for more than 24 hours in 3 years. Wow, I never thought about it that way. I guess I can't ever use the excuse of being lonely, the word exhaustion come to mind instead. Part of the retreat requires no caffeine, alcohol, sugar or loud music (just kidding on the last part). But in all seriousness I will be waking at 5:30am in the morning to practice my yoga, breakfast, long hikes through the hills with breath taking views of the ocean, lunch, massages, weight training, more yoga, dinner, group activities, then fall into bed around 9:30 pm. 6 days of this sounds like bliss while typing, but I'm a bit afraid of it all. Most days I am so exhausted by 5pm as the twins take so much of my chi, prana, energy, all of it. I've begun removing caffeine and sugar from my diet so far. The wine will go next week. It's no easy task, but I can already see the benefit in my eating patterns which brings us to our recipe. 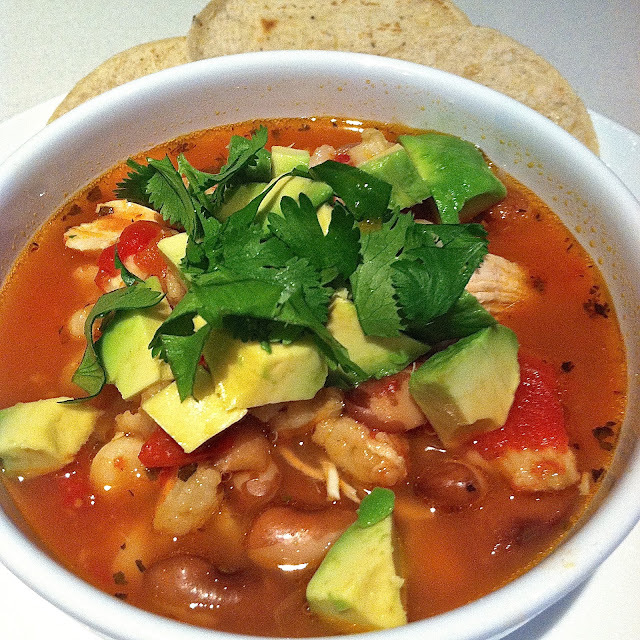 Pozole or posole is a traditional Mexican stew made with hominy. 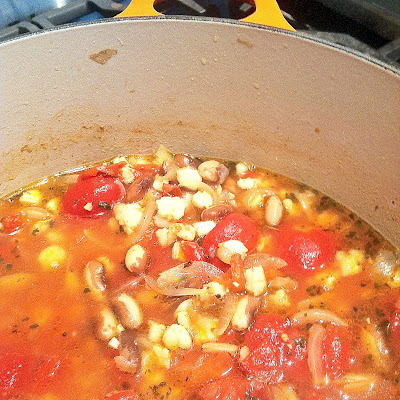 This recipe does require a bit of work, but if you plan it right by soaking the beans and hominy the night before you can pull it off over a weekend and the payoff is well worth it. This recipe is made with chicken stock and chicken, but could easily be made vegan if you substitute veggie broth and omit the chicken all together. I imagine it would still taste divine. 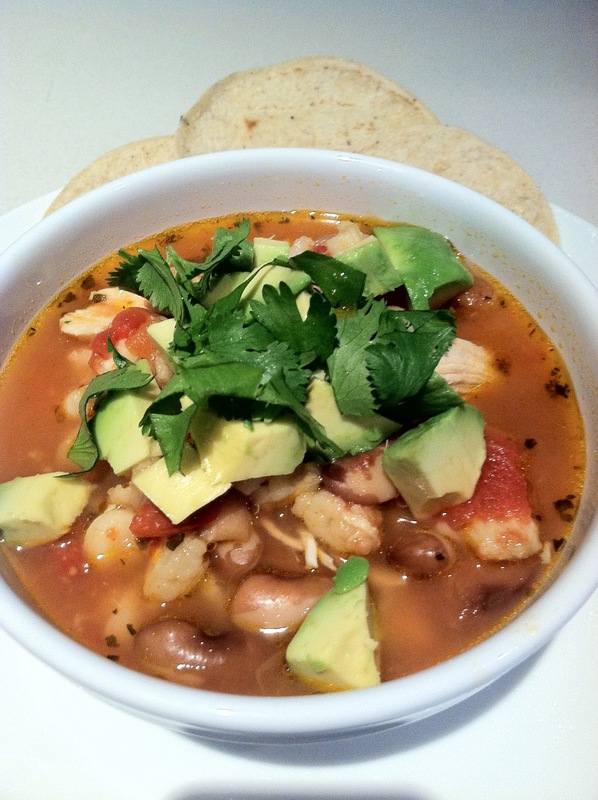 Look for prepared or dry posole in your health food store or gourmet shop. I know both Rainbow Grocery and BiRite Market carry Rancho Gordo's brand which is an heirloom variety. You don't want to use the canned variety as it has a rubbery and gummy texture in my opinion. The beans I used were Good Mother Stallard, also a heirloom Rancho Gordo variety. These plump up nicely and provide a flavorful stock. You could substitute any pintolike bean for a similar flavor. Place beans and posole in separate medium stock pots or sauce pans, cover with water by 1 inch and let soak several hours or overnight. Rinse and recover beans and posole with 2 inches of water. Cook beans until tender (about 1 - 3 hours) depending on how old they are. Boil them for the first 5 minutes and remove any scum which floats to the top. Then reduce to a gentle simmer. You will know they are close when the smell emits a deep bean aroma. I like to add a chopped up small onion and a garlic clove sautéed in 1Tbs olive oil to the pot to add additional flavor to the beans. You could also add a chopped up carrot and celery stick for more flavor. Add 1 tsp salt 15min prior to finish. Adding salt too early will only delay the cooking process. Once the beans start to taste tender is when I add it, go slowly as salt can take up to 15minute to penetrate the beans. For the posole, add 1 chopped onion quarter, and simmer over a medium low heat covered until tender, about 3 hours. Season with salt toward the end of cooking and add water as needed to keep the posole covered. Slit the chiles and remove the seeds and stems. Heat a small, heavy skillet over medium high heat and toast the chiles until they puff slightly and emit a spicy fragrance, about 15 seconds per side. Watch closely as burnt chiles taste bitter. Place the chiles in a small bowl and cover with boiling water (I used a bit of the hominy stock). Let soak for 20 to 30 minutes. In a blender, puree the chiles with enough of the soaking water to make a puree with the consistency of orange juice. Cut 2 onion quarters into thin slices. In a large stock or soup pot heat oil over medium heat and add onions and garlic and sauté until soft and fragrant, 2 - 3 minutes. Add the oregano, chicken broth, chili puree, and the tomatoes. Add the posole with 1 cup of it's cooking liquid. Bring to a boil and add a little salt if needed. Add the beans and simmer for 20 - 30 minutes to allow the flavors to blend. Add the chicken and stir to warm through. Season with salt and pepper. Cut the remaining onion quarter into small dice, ladle the soup into deep bowls and top with onion, lime, avocado and cilantro. Happy Valentine's Day everyone. I've had my fair share of good valentine's days and bad ones. My husband and I went on our first lunch date without realizing it until the day of (it was a Tuesday and only lunch). That was a good one, I've also had a well planned one with rack of lamb, chocolate cake, the works, only to have it fall completely apart, but made into one of my most memorable to date with several ladies and a suitcase full of costumes. 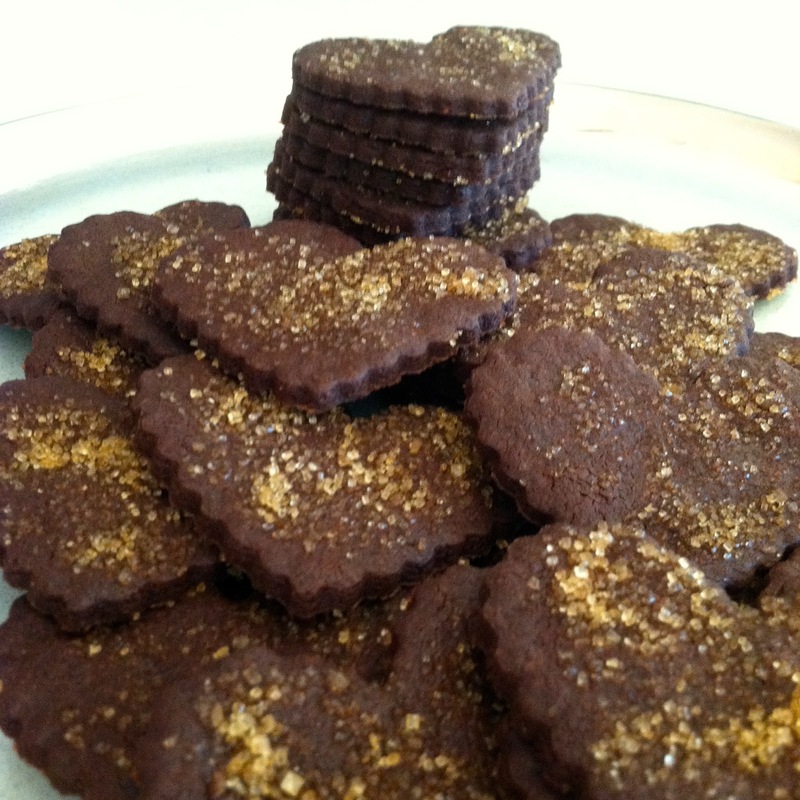 This year I wasn't planning anything until I saw smitten kitchen's posting for intensely chocolate sables. This seemed to fit perfectly as I don't allow my children a ton of sugar, but wanted something a little sweet to give my sweeties today. Sift flour, cocoa and baking soda together into a medium bowl. Cream butter, sugar and salt together in a bowl with an electric mixer until light and fluffy (about 4min on med). Add egg yolk and vanilla, beating until combined while scraping down the sides. Add dry ingredients, powered chocolate and mix until well combined. I had to use my hands in the end to incorporate all the fine powered materials. I more of less kneaded the dough until it all came together into a ball. Wrap tightly in plastic wrap and using the palm of your hand flatten into a disc about an inch and a half. Refrigerate no more than 30 - 45 min as it does not need to get fully hard or it will be harder to roll out. 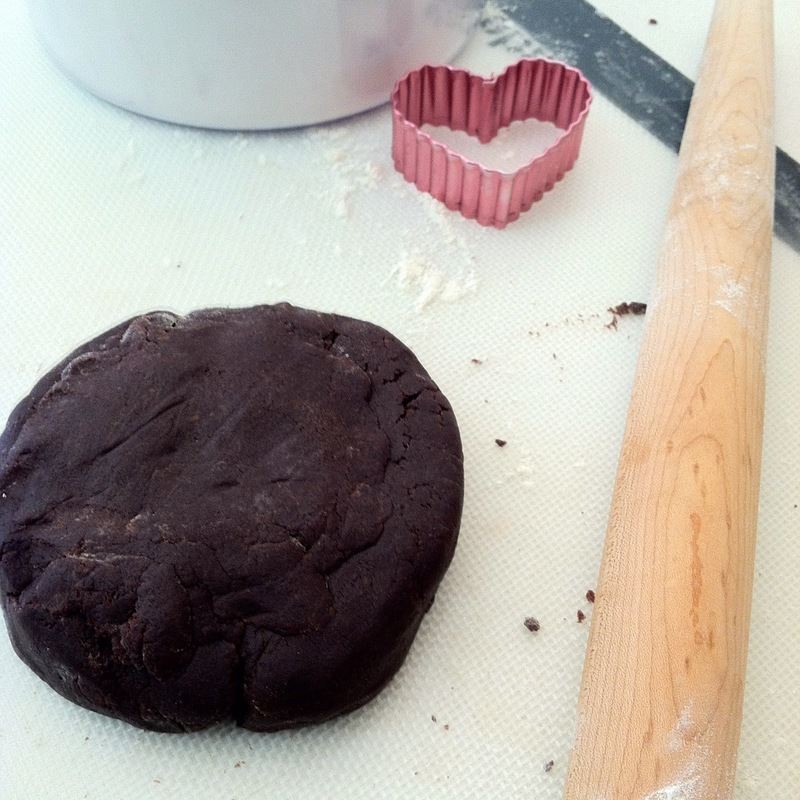 The dough can be refrigerated until needed (a day or two, or up to 6months in the freezer). Just be sure to allow it some rest time to warm up and soften before rolling it out. Heat oven to 350 degrees. On a floured surface, roll dough out gently until it is 1/8 inch thick. I would suggest flipping it over after every 2-3 rolls to ensure it doesn't stick and to replace any cracks which may have formed. It's pretty malleable so don't worry about working it too hard. 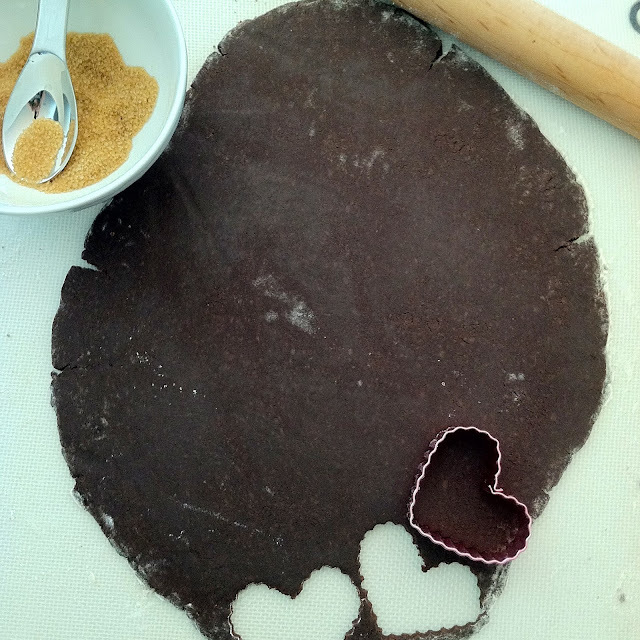 Cut into desired shapes and space 1 inch apart on a parchment-lined baking sheet. Sprinkle with decorative sugar and bake for 8 - 10 min. 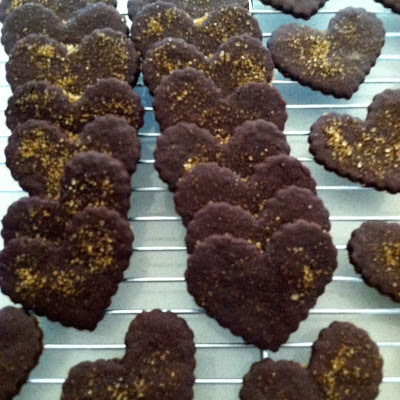 Leave cookies on baking sheet to cool for a couple of minutes before gently and carefully transferring them to cool completely on a rack as they are fragile. 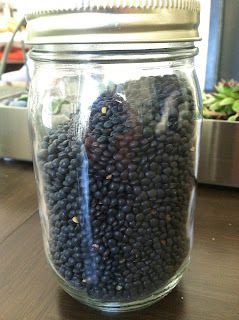 Store in an airtight container for up to two week, if they last that long. Please forgive me as I forgive myself for failing to keep on top of this blog. As soon as September hit, I found myself spending any free time I had on preschool selections for my twins in San Francisco. My applications have been sent and fingers are crossed we get some good news come March. Tonight is New Year's Eve and while many of you may be heading out to celebrate, we have decided to stay in, light a fire and enjoy some good food along with some celebratory wine. 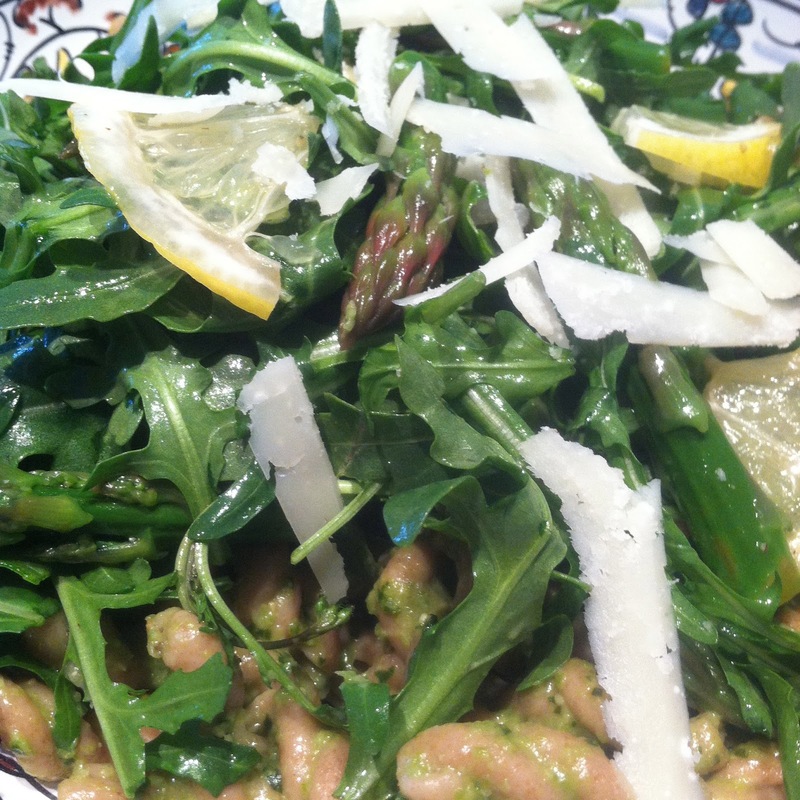 This recipe was crafted after finding some beautiful looking green beans and celery at the farmers market. Besides fennel and pomegranates this was all that looked good this time of year. I tried one of Heidi Swanson's dressings tweaked a bit from her famous 101cooking.com website. 1 lb green beans chopped into 1/4 inch pieces parboiled in a pot of salted water for 1 minute. 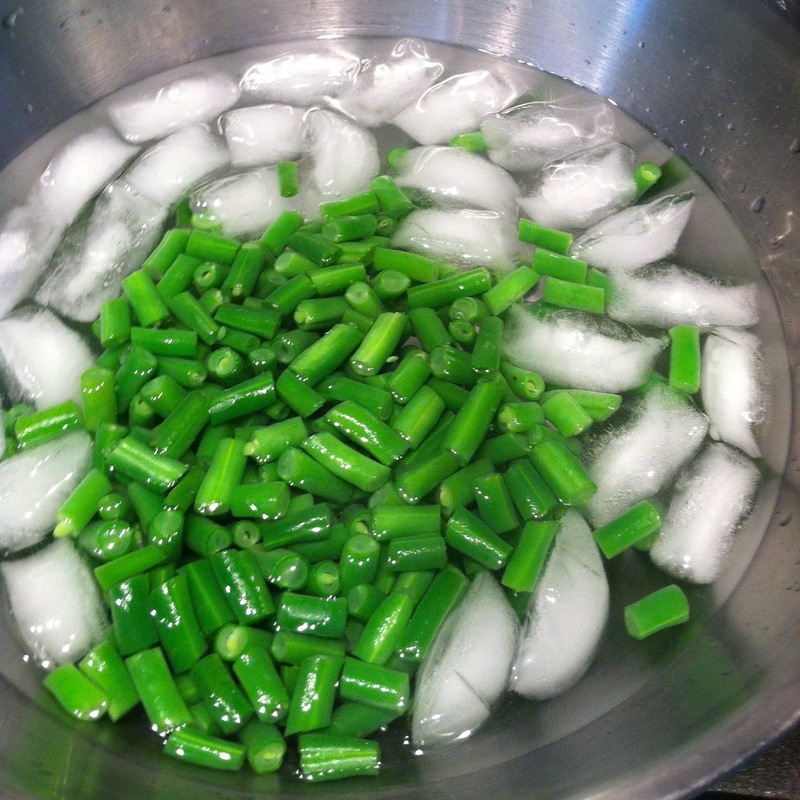 Drain and immerse immediately into a bowl of ice water to stop the cooking. 4 slices rustic bread torn into bite sized pieces tossed with 2 tablespoons olive oil and baked in a 350 degree oven for 10 - 15 minutes tossing 1/2 way through. Place the raisins in a bowl with the wine and soak for at least 2 hours or overnight. If you don't have any sweet wine on hand you can omit and soak the raisins in hot water at least 45min prior to plump them up. For the dressing, mash the egg yolk with the cream fraiche and slowly add the olive oil beating continuously. It should be glossy and smooth. Whisk in the vinegar then the salt. Taste and adjust if needed. 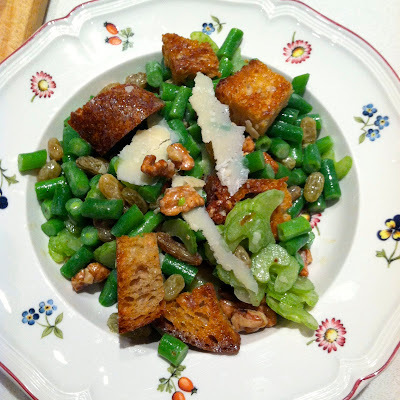 Just before serving, drain the raisins and toss with the celery and green beans. Pour on 1/2 of the dressing and toss with half of the toasted walnuts. Taste and add more dressing if you want. Add most of the croutons and a few shavings of parmesan cheese and toss again. Top with the remaining walnuts, croutons and a few more shavings of parmesan cheese. All right, perhaps it's 10, but who's counting when it can be that quick. It all started with me not planning adequate time for dinner since the current heat wave has us staying out past 5pm every night. Not to mention I am touring preschools with a vengeance right now. Who knew the process would be so time consuming and competitive considering I need to find two spots together at the same school. I knew I had some leftovers on hand, but also one too many overripe tomatoes sitting on the counter begging to be used. This sauce did well over some fresh tortellini tonight, but could be used in so many other ways. This recipe comes from my good friend Julie who recreated it from memory from one of our favorite restaurants in San Francisco. You can check her website here thecrosbykitchen.com for other delicious vegan and vegetarian recipes. Peel and smash garlic with the back of your knife. 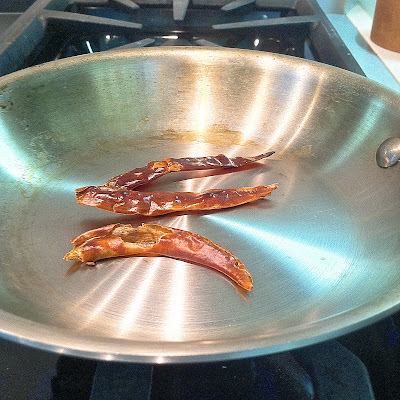 Saute garlic with olive oil, salt and crushed red peppers for 1 - 2 minutes on medium high heat. Don't burn the garlic, I tend to tip the pan on it's side allowing the garlic to immerse and flavor the oil. 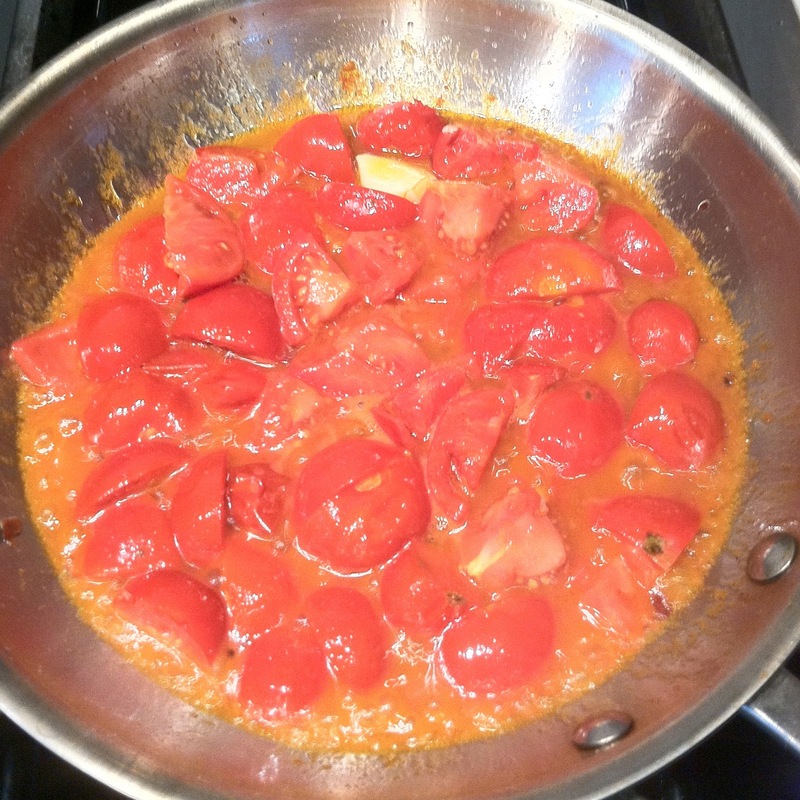 Add chopped tomatoes and simmer 5-7minutes over medium heat until broken down and oil and tomatoes have emulsified. I use my wooden spoon to brake the tomatoes down quickly. 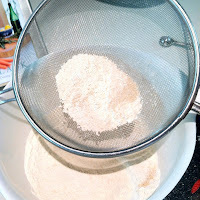 Add lemon zest to finish, then pass through a food mill to produce a smooth consistency only a toddler would request. The last task is optional, otherwise remove garlic prior to serving. When my little ones started eating solid foods, they were fairly easy going on trying anything once. Austin has continued with this, while Olivia only eats certain things. No pasta, cheese, meat or anything resembling a mixture of foods. She likes things plain and separated on her plate. Peas, carrots, rice, all must be in their separate bowls or she won't touch it. Thankfully she hasn't lost her appetite for carotenes. Sweet potatoes, carrots and beets are always an easy sell so I have found many different ways to serve them. 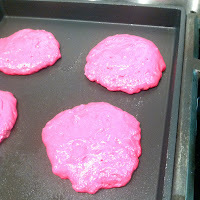 When I came upon this recipe from weelicious.com I knew I had a winning breakfast meal. Beets belong to the same family as chard and spinach. Full of folic acid, fiber, manganese and potassium, they cleanse the liver and have been found to be a protective role against colon cancer (Murray, p. 165). If you haven't ever been a fan of beets, try this recipe as you may be surprised at how good they can taste. 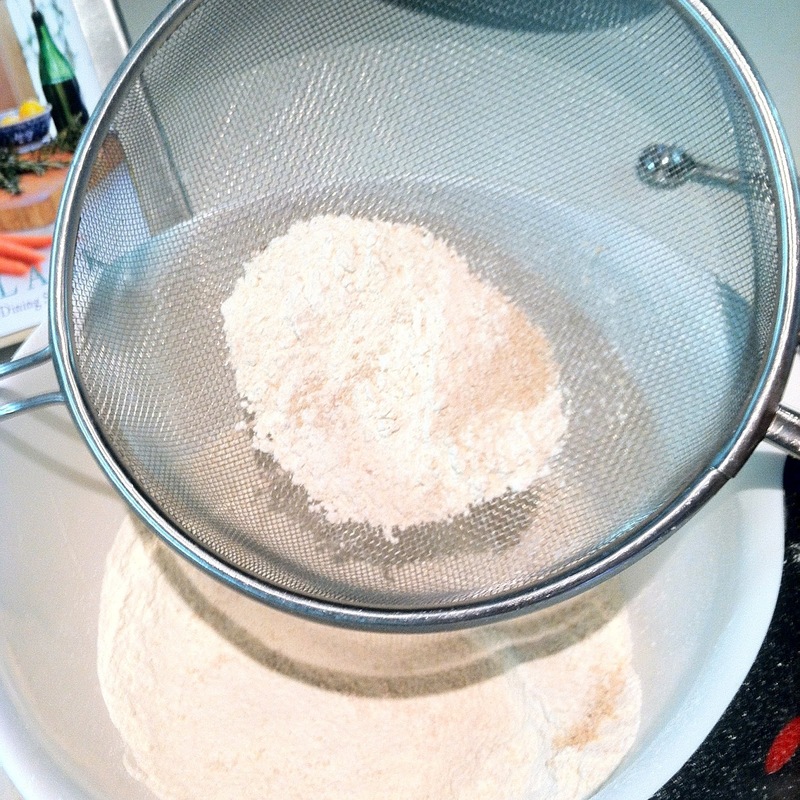 Sift the first 5 ingredients into a medium size bowl. Mix the remaining ingredients into a small bowl until well combined. Pour wet into dry and stir until incorporated. 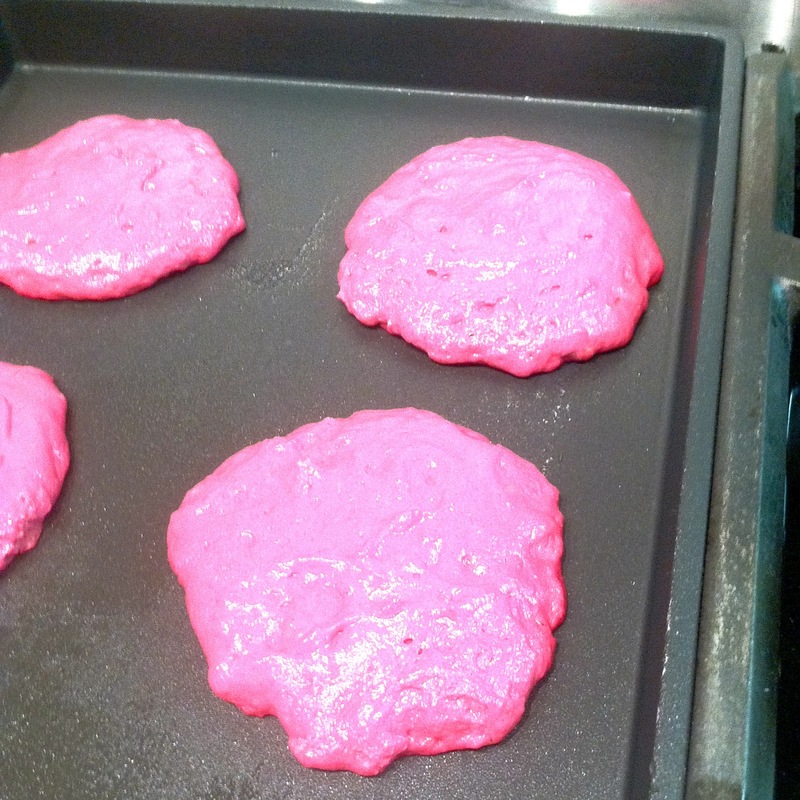 Don't over mix or your pancakes will turn out flat (a few lumps are good). Drop by the spoonful (2 tablespoons) into prepared pan and cook for 2 - 3 minutes on each side until browned. 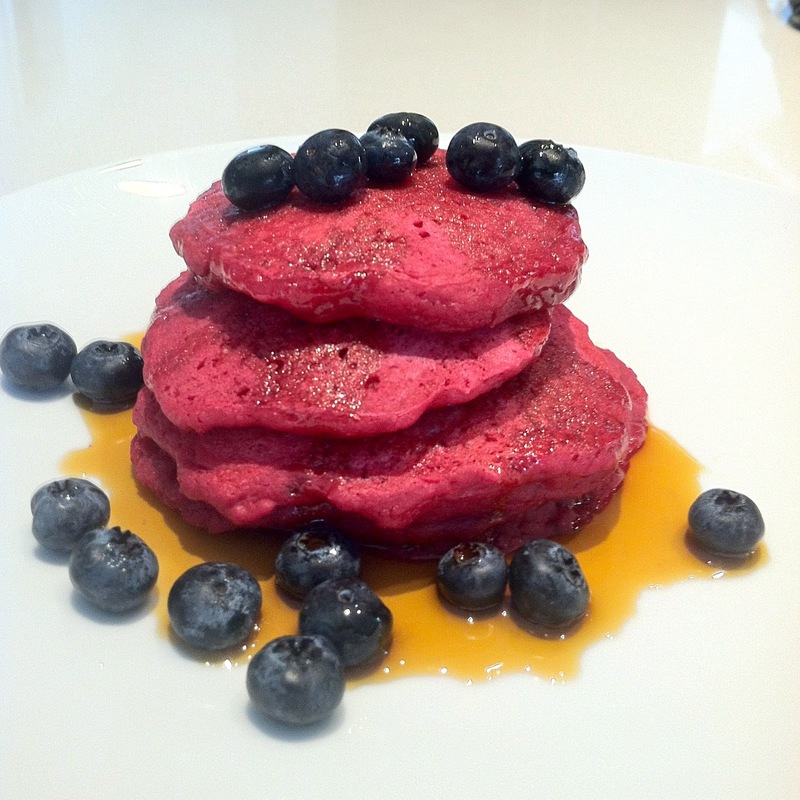 Enjoy with maple syrup, fruit or applebutter as a low sugar choice. Murray, Michael. The Encyclopedia of Healing Foods. New York. Atria. 2005. Many children have started school this week. Mine are still at home which has been such a treat. We are in the process of moving them into toddler beds telling me they are no longer babies. Where does the time go? Each day I take pause to appreciate them for who they are in this exact moment as I will never get it back. I already find myself fondly viewing baby photos wondering where did the time go? The days may be long, but the years are flying quick. Most days we head to a park, museum or our local zoo to discover the world around us. I think the train room at the Discovery Museum is Austin's favorite as he is a big train and car aficionado just like his dad and grandpa. Olivia prefers the big parks like Mission Dolores where she can climb, explore and slide down the huge slide. 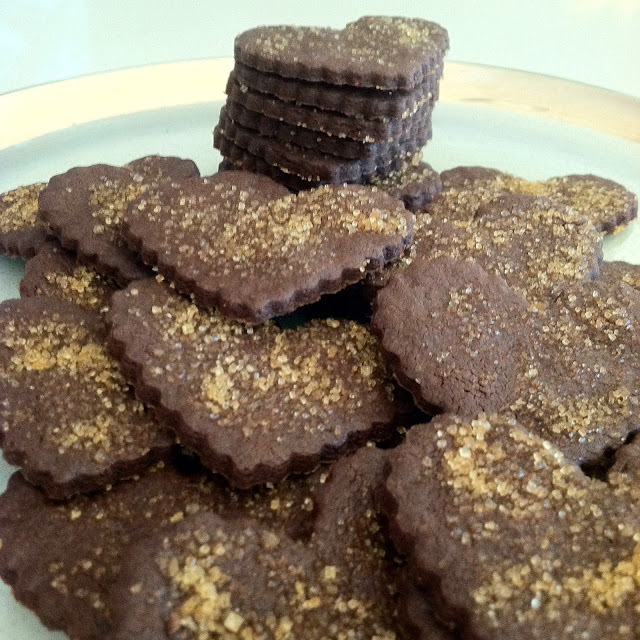 Today's recipe is inspired by the annual pagan festival taking place out in the desert right now. Every year I reminisce with a hopeful thought I may make it back one day. For now, I'm happy to be clean and cooking a meal I would have brought out there to share. Preheat oven to 400F. Scrub and dry beets. Drizzle with olive oil in a bowl and wrap into two separate aluminum foil packages. Roast until tender, about 45min to an hour (I use a fork to test when juices run easily they are done). Let cool just enough to handle, allowing the skins to peel off easily with your fingers. 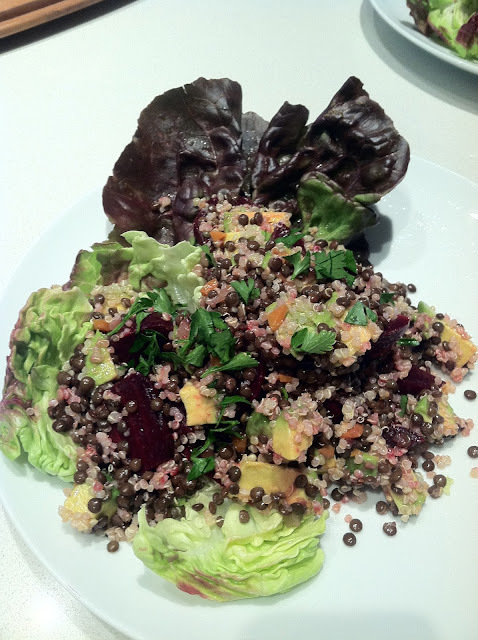 Cut them into 1/4 inch wedges and place into large salad bowl. Rinse quinoa under cold water. Bring a medium saucepan of water to boil and add quinoa and 1/2 teaspoon salt. Reduce heat and let simmer until quinoa is fluffy but still has a bit of bite. Drain and rinse under cool water to stop cooking. Drain and add to beets. 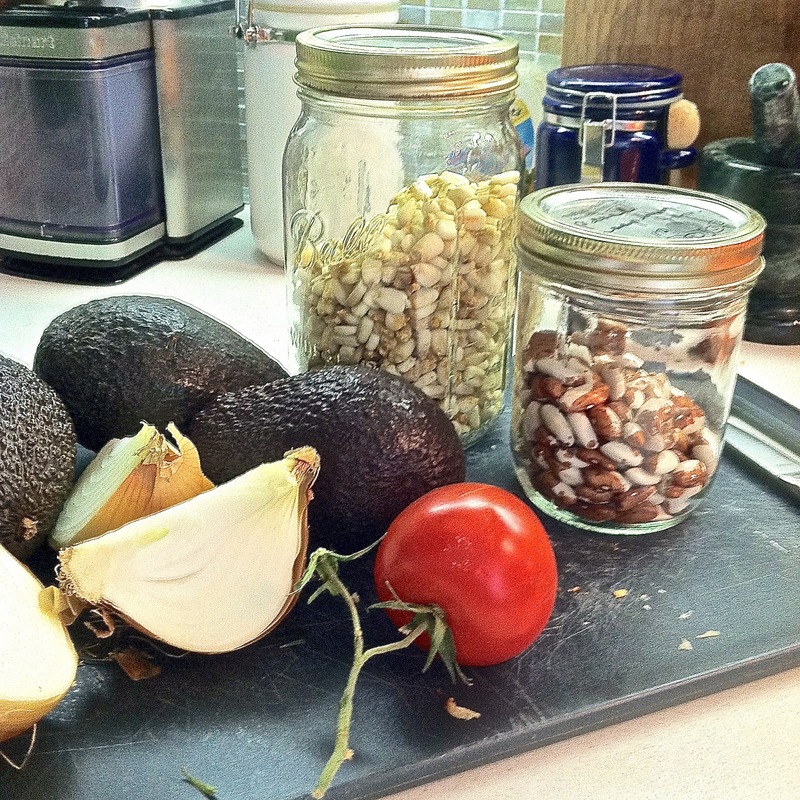 Add the lentils and avocado to the bowl and toss gently. In a small bowl, whisk together all ingredients and season with salt and pepper. 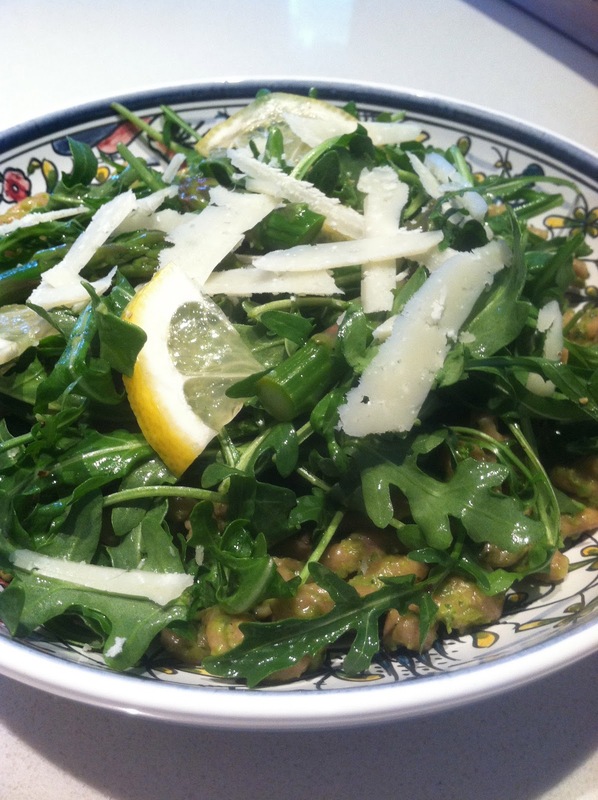 Drizzle over salad right before serving, and serve at room temperature within 2 hours. Copyright All photographs, illustrations and graphic designs are Kari Zazzara originals.. Simple theme. Powered by Blogger.